Posted: June 19, 2018 in Amazing and Interesting Stories, Animals, Humor, Interesting Photos, Nature, News, WTF? First off, big thanks Faris for letting us know which end went in first. I guess that is better than the alternative though? Helluva way for Wa Tiba to go in any event, amirite? Getting eaten by a python while checking your garden on Muna Island in Southeast Sulawesi? Yikes. And to think you believe you’re having a bad day because little Bryce doesn’t want to go to Camp Happy Hopes for 2-weeks. Anyway, I guess the moral of the story is that when in Indonesia checking on your veggies, keep your head on a swivel. 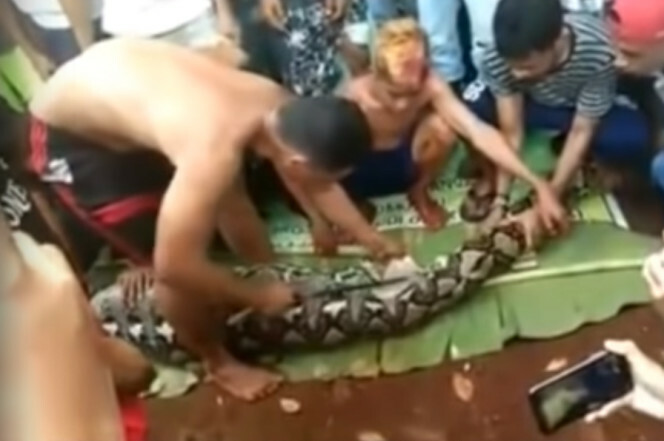 PS- How in the hell does a 23-foot long python sneak up on somebody? Slithering quietly like a mofo I guess. Chills, man.